A small press revitalizes bookmaking—as bone-folded, hand-sewn, group-produced art. It was production day at Crumpled Press headquarters. The editors—Jordan McIntyre, AB’99; Alexander Bick, AB’99; Aaron Tugendhaft, AB’99, AM’06; and Nicholas Jahr—convened on a Saturday in January to churn out the press’s newest batch of Codex in Crisis, a 64-page treatise on book digitization by Princeton historian Anthony Grafton, AB’71, AM’72, PhD’75. But the scene at McIntyre’s Brooklyn loft was more craft circle than assembly line. And the dozen workers, paid in cheese and pretzels, looked downright happy to snip string and strips of glue, slice paper, fold covers ejected from an Epson printer, feed books into the drill press, and slide black thread into spines. The session wrapped at 8 p.m. with 78 fresh books, each binder’s initials proudly scrawled in the colophon of his or her creation. 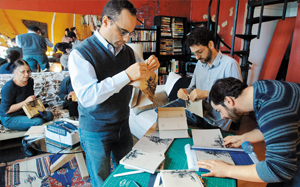 Editors Tugendhaft, Bick, and McIntyre cut and fold at a binding party. The Crumpled Press, the brainchild of McIntyre and Bick, publishes work by new authors and sets previously unpublished, notable lectures and articles into proper books—hand-sewn—on culture, politics, self-reflection, and poetry. “It’s original, thought-provoking work that might otherwise be tossed aside,” says Bick, who is pursuing a history PhD at Princeton. “Hence the name Crumpled Press.” In the four years since the outfit’s birth, they’ve published nine titles—from a series of fictional voicemails placed on 9/11 to a meditation on Darwinian selection, sexuality, and fashion—priced from $5 to $25. Crumpled Press sold out of its 100 copies of When I Wished I Was Here: Dispatches from Fallujah (2007) by Derek McGee, a friend of Bick’s, after his reflections on his Iraq combat tours appeared on Slate’s army blog, the Sandbox. To replenish the supply, the editors threw more binding parties. The book has now sold more than 700 copies. In 2005 the press took shape when McIntyre fished out from under his bed a series of poems he’d written for his undergraduate English thesis. “I figured I’d take the Whitmanian route and publish them myself,” he says of the collection, Still Leaves. Typesetting in Microsoft Word, he bound the poems in textured paper, and as a surprise his mother embroidered the cover with needlepoint leaves. Today the four editors work with each author to create a book’s artisanal feel, reproducing journal sketches or deliberating fonts, flyleaves, and covers, to savor the printed-page aesthetic in an era of digitized technology—including sites for e-books, such as Google Books or the Amazon Kindle. Grafton’s Codex in Crisis reflects on this very topic. Expanded from a 2007 New Yorker article, the book was first released in a limited edition of 250 copies, each hand-numbered with a letterpress cover and holding a fold-out color plate. The press’s methods rely on “back-solving”—observing and adapting techniques of larger publishers while using the resources available to them. Early on, McIntyre aligned pages inside a phone book before punching holes to create a spine. He learned how to saddle-stitch from one of his mother’s art books, and designed a wooden rack to help with drilling. As it’s evolved, the outfit has invested in a drill press, an $850 paper-cutter, and a photo printer.